Pope Benedict XVI has named 24 bishops who will be elevated to cardinal on Nov. 20, 2010. The list includes our local Archbishop Donald W. Wuerl. Twenty are under the age of 80—making them eligible to serve as cardinal electors (i.e., those who would have a vote at a papal conclave). There are currently 102 cardinal electors (out of a total of 179 cardinals). Before the new cardinal electors join the College of Cardinals, Jānis Cardinal Pujats of Latvia will reach the age of 80, resulting in a total number of cardinal electors of 121 going into 2011. A majority of these cardinal electors will continue to be those who were selected by Pope John Paul II (71 electors or 59%). Ten other cardinal electors will reach the age of 80 before the beginning of 2012. These ten include Bernard Francis Cardinal Law and William Henry Cardinal Keeler of the United States. The Cardinals of the Holy Roman Church constitute a special college whose responsibility is to provide for the election of the Roman Pontiff in accord with the norm of special law; the cardinals assist the Roman Pontiff collegially when they are called together to deal with questions of major importance (Canon 349). Given these duties it might be expected that the composition of the College might generally reflect the composition of the global Catholic Church. However, geographic disparities by Catholic population size continue to be evident. For the last century, the Western Hemisphere has been underrepresented at the Catholic Church’s papal conclaves in terms of the size of its growing Catholic population. Of course cardinals are not representing any geographic area at a conclave. Yet commentators and academics have commented on aspects of nationalism, such as Thomas Reese, who notes that “nationality is clearly important” at papal conclaves (see: Inside the Vatican: The politics and organization of the Catholic Church. 1996. Cambridge, MA: Harvard University Press, p. 96). It is no coincidence that such a long time has passed since a non-European has been elected or that so many Italians have been selected. The two most recent popes are the only selections from outside of what is now Italy since 1522 and it has been more than 1,300 years since someone who was not born in Europe has served as pope. Historically it often made sense for many cardinals to be Italian as the Church could not wait long periods of time for cardinals to travel to conclaves. It is also the case that many in the Church’s hierarchy resides in Rome and the pope is the Bishop of Rome, Primate of Italy, Sovereign of the State of Vatican City, etc. But technology has caught up with history and now cardinals can quickly travel to Vatican City from anywhere in the world. Thus, it is interesting to see that the College is still so heavily populated by Italians. Eight out of the 20 new cardinal electors were born in Italy. In the last 50 years, European cardinals in general have continued to be much more numerous among all voting members of the College as European Catholics have become a smaller and smaller share of the world’s Catholic population. Now for the data… All geographic divisions used below reflect the organization of the Church itself. These are the boundaries designated by the Catholic Church in its annual data collection efforts and reporting. The primary source for much of the data is the Vatican’s Central Statistics Office (i.e., Annuarium Statisticum Ecclesiae, 2008). Thus, the units of analysis and the quality of data should both be viewed in light of this being how the Catholic Church organizes, views, and, describes itself to the world, rather than some arbitrary classifications. Using these definitions we can measure geographic disproportionality using the standard Loosemore-Hanby Index (Loosemore and Hanby 1971, “The Theoretical Limits of Maximum Distortion: Some Analytic Expressions for Electoral Systems.” British Journal of Political Science, 1: 467-477). If the percentage of voting cardinals from each region were the same as the percentage of the world Catholic population in each region then disproportionality would be zero (representing perfect apportionment). As 2011 begins, the total regional disproportionality between cardinal electors and the Catholic population will measure 32.8 percentage points. Update (2/28/2013): The figure below for the 2013 conclave can be found here. In the most recent annual edition of the Annuarium Statisticum Ecclesiae, the Vatican estimates that 49.4% of the global Catholic population resides in the Western Hemisphere. 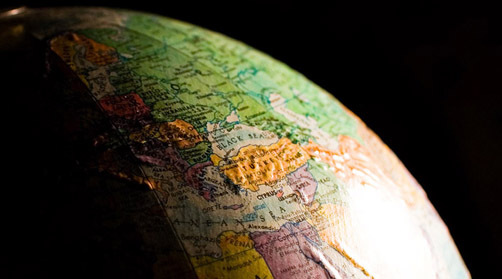 Yet, in 2011 only 28.9% of the cardinal electors will be from this area of the world. This includes the United States, which is actually over-represented in the College (10.7% of cardinal electors and 5.9% of the world’s Catholic population. Italy is the most overrepresented 20.7% of cardinal electors and 4.9% of the world’s Catholic population). 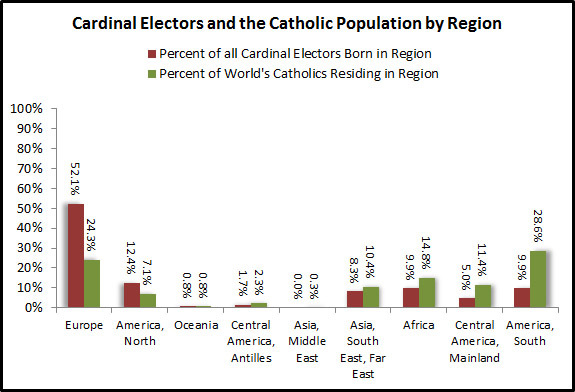 South America remains the most underrepresented with only 9.9% of cardinal electors and 28.6% of the world’s Catholic population. Above photo courtesy of ToastyKen at Flickr Creative Commons. In the previous post we showed interesting similarities among Christians in the United States regarding belief in and knowledge of the Real Presence. Some additional context is shown in the figure below again using data from the 2008 American National Election Study. There are distinct differences among Protestants by views of the Bible. 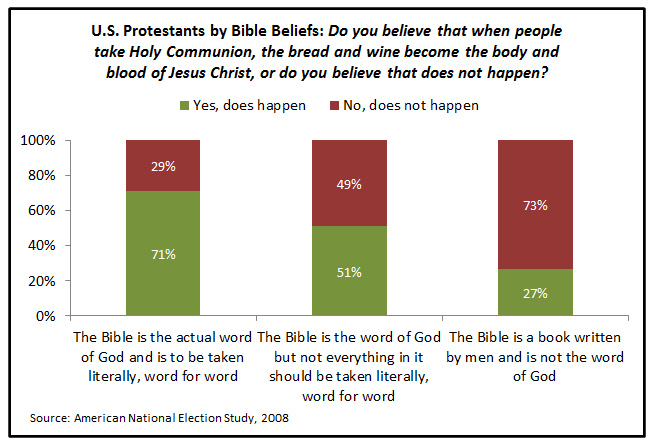 About seven in ten who believe the Bible is to be taken literally word for word also believe that “when people take Holy Communion, the bread and wine become the body and blood of Jesus Christ.” Among Protestants who do not take the Bible as literally word for word, the percentage who believe in the Real Presence declines. The Pew Forum on Religion & Public Life’s recent U.S. Religious Knowledge Survey has unearthed evidence of an identity crisis among American Catholics. “More than four-in-ten Catholics in the United States (45%) do not know that their church teaches that the bread and wine used in Communion do not merely symbolize but actually become the body and blood of Christ” (Pew, p. 8). Among the American public overall, “about half of those polled (52%) say, incorrectly, that Catholicism teaches that the bread and wine used for Communion are symbols of the body and blood of Jesus” (p. 24). Unlike the discussions surrounding the last major Pew study with significant implications for the Church I have no doubts of the discourse regarding the latest Catholic results. It is very likely the case that only about 55% of Catholics are aware of what the Catholic Church teaches regarding the Real Presence. At the same time, as someone who has been surveying Catholics nationally for nearly a decade I know there is still a deeper story to tell. There is a gap in Catholics’ knowledge of their Church’s teachings and what their beliefs are. It may be a classic case of source amnesia. Other recent surveys (including CARA’s) indicate six in ten to three-quarters of Catholics believe in the Real Presence. This is most likely among those who attend Mass frequently. Strangely enough, many Catholics believe what their Church teaches without realizing that their Church teaches it. Catholics fit into four groups regarding the Real Presence. The first are the Knowledgeable Believers who know what the Church teaches regarding the Eucharist and also express a belief in this teaching. Because majorities of Catholics believe and know of these teachings it is also the case that some percentage of Catholics falls in the group of the Faithfully Unaware. These are truly rebels without a cause who believe in the Real Presence but believe they are doing so (wrongly of course) in opposition to what the Church teaches. It is also the case that some percentage of the Catholic population must be unaware of the Church teaching and also unbelieving in the Real Presence. Although disappointing, there is hope in these “Uns” (unbelieving and unknowing) as these Catholics may come to believe what the Church teaches if they became aware of it. The Church will likely have a more difficult time winning over the Knowledgeable Doubters. These Catholics are aware of what the Church teaches but say they do not believe it. The only way to know how many Catholics are in each cell of the table below is to ask these two questions in combination (…and if anyone is interested in doing so they could do so in an upcoming CARA Catholic Poll). The identity crisis unearthed by Pew is by no means limited to Catholics. Another recent survey, the American National Election Study of 2008, shows that other Christians offer up equally mystifying responses to questions regarding the Real Presence. The ANES asked all Christians (who are citizens of voting age as this is an election study) the Transubstantiation question shown in the table above: Do you believe that when people take Holy Communion, the bread and wine become the body and blood of Jesus Christ, or do you believe that does not happen? 1) Yes, does happen or 2) No, does not happen. Seventy-four percent of Catholics surveyed indicated a belief that the bread and wine become the body and blood of Jesus Christ. That is reassuring (and fairly consistent with other surveys regarding this subject). The surprises are in the number of non-Catholic Christians who also state they have this same belief. 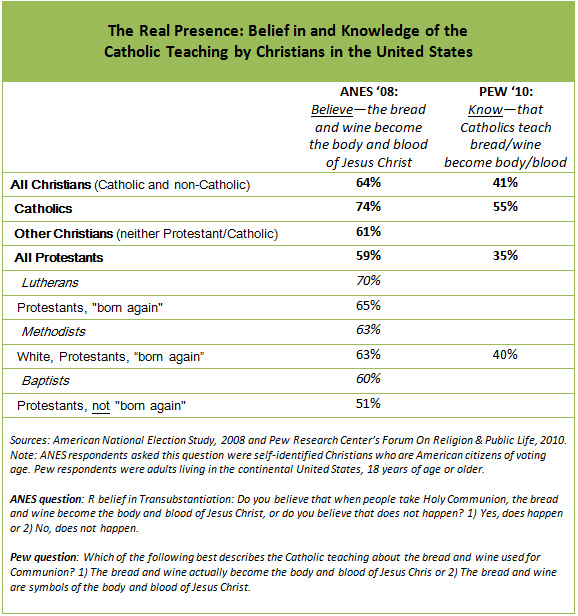 Nearly six in ten Protestants (59%) surveyed expressed a belief in Transubstantiation. The Pew survey indicates only 35% of Protestants are aware that the Catholic Church teaches this doctrine. Seven in ten Lutherans express a belief in Transubstantiation and this is not all that surprising considering the teachings within this denomination are sometimes more similar to those of the Catholic Church than those of some other denominations (e.g., “Christ's true body and blood in the Lord's Supper are "hidden under" the earthly forms of bread and wine”). 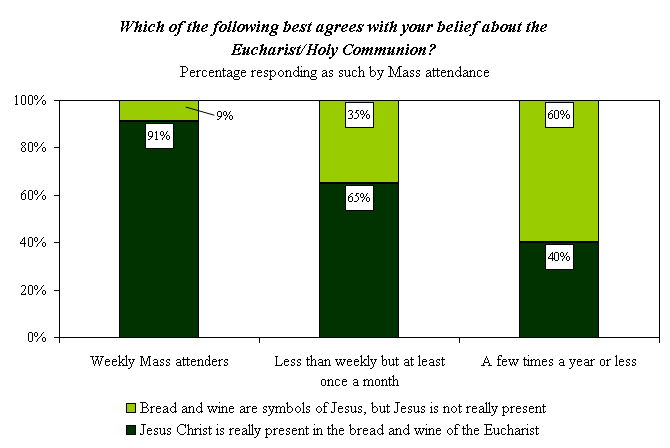 What is perhaps most surprising is that a majority of all significant sub-groups of non-Catholic Christians in the United States (i.e., those with a sufficient size that the number of interviews allows for an estimate) express a belief regarding the Eucharist that is consistent with Catholic Church teachings. The Pew results also indicate that they do so with little knowledge that the belief they affirm is a teaching of the Catholic Church. Again we may have another case of source amnesia—believing something you once heard but without memory of the source of that belief. The Catholic identity crisis is interesting. I must say the Protestant case even more so. Should the Catholic Church be more concerned that people don’t know what it teaches or surprised that so many non-Catholic Christians believe it—often in opposition the teachings of their own denominations? How do so many Protestants—including those who identify themselves as “born again” come to believe a Catholic teaching regarding the Eucharist? This teaching was at the heart of anti-Catholic criticisms and caricatures of the Catholic faith for hundreds of years. Other than source amnesia what could this be attributed to? Perhaps another set of Pew survey results provide a clue. Some 59% of Evangelicals say the Bible is the “Word of God, literally true word for word.” If this is the case, many Evangelicals may take a literal reading of the passage such as Matthew 26:26-28 and incorporate this into their beliefs without realizing the literal interpretation is consistent with Catholic teachings that their particular denomination may not agree with (...and there is evidence for this link...). The exploratory analysis above has its limitations. It is based on two separate surveys and the ANES does not include non-citizens. It is also the case that both survey questions cannot possibly capture all the nuances of the teachings and theology of the Catholic Church on this matter (although both questions are intentionally attempting to reflect these teachings specifically). Despite these limitation it definitely points to a need to explore this issue further. On What Wave Did Your Ancestors Ride? Tuesday, October 12 is the 518th anniversary of Christopher Columbus's arrival in the Americas (at a location in what is now The Bahamas). Although we know Columbus was Catholic there is still some debate of his nationality and ancestry. Most believe that he was from Genoa, in present-day Italy. The story of Catholicism in America is deeply rooted in waves of immigration that followed well after Columbus. These waves are often remembered today in how American Catholics self-identify their ancestry, which we can measure in polls. For some there is no knowledge or memory of this and these people often just say they are of “American” ancestry. While others still deeply identify with the country of their grandparents or great grandparents, etc. Yet when one looks at polling data on ancestry for Catholics there are always a few surprises. 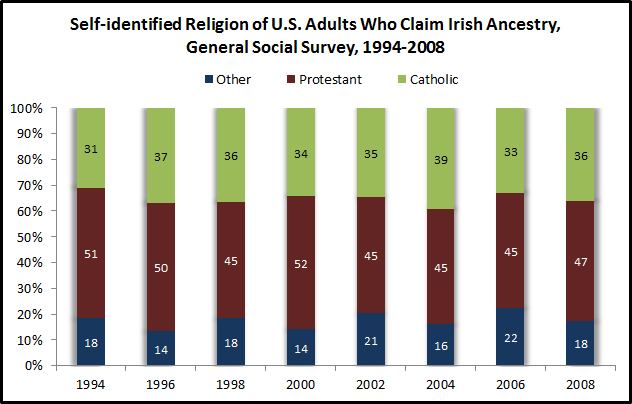 Perhaps the biggest is that Irish Americans are more likely to be Protestant than Catholic. This has been noted among academics (e.g., “How the Irish Became Protestant in America” by Michael Carroll in Religion and American Culture: A Journal of Interpretation, Vol. 16, No. 1 and “The Success and Assimilation of Irish Protestants and Irish Catholics in the United States” by Andrew M. Greeley in Sociology and Social Research, Vol. 72, No. 4) but is less well known among the media and general public who often assume that Irish and Catholic are virtually synonymous. On average, only 35% of Americans who say they are of Irish ancestry self-identify their religion as Catholic. By comparison, nearly half of this group (47%) indicates their religion as Protestant. It is the case that Americans of Italian ancestry are more likely to be Catholic than any other faith (on average between 1994 and 2008, 65% of Americans of Italian ancestry self-identified as Catholic. Although in the most recent GSS survey, in 2008, only 59% of Italian Americans indicated they are Catholic). However, few Americans may realize that there are almost as many adult Catholics today who say they are of German ancestry as there are who say they are of Italian ancestry (even with only about 17% of those of German ancestry self-identifying as Catholic. More Americans claim German ancestry than any other). The graph below shows the average percentage of adult Catholics in the United States who identify ancestry with countries that have had significant immigration to the Americas in the last 150 years. Each bar represents a decade average with the orange bar showing the last decade. 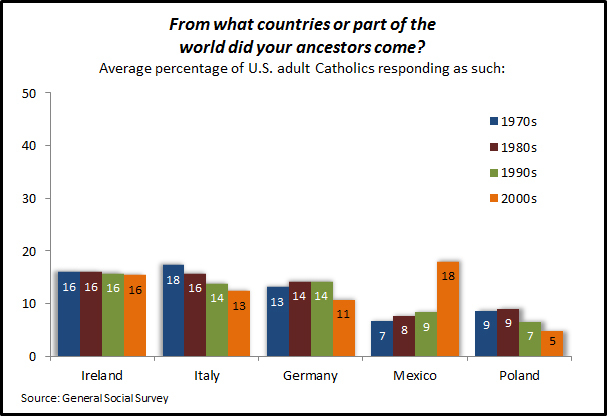 Overall, the biggest recent shift has been in the number of adult Catholics who self-identify their ancestry with a Latin American country and specifically with Mexico. We have commented elsewhere about the generational shift in the racial and ethnic composition of the Catholic population. Along with this change, Mexican ancestry has grown larger than Italian or Irish ancestry among American Catholics. In the most recent GSS survey, 69 percent of American adults of Mexican ancestry self-identified as Catholic. Above photo courtesy of Dominic's pics at Flickr Creative Commons.